When Nashville started to turn to a seller’s market a few years ago, we started to experience something that had not happened in the past. At least not to this degree. And that was the “Coming Soon” listing. Tennessee state law says that in order for a home to be advertised, the real estate agent needs to have a listing agreement signed by all parties. It’s a good law to protect consumers, but it also caused problems. Imagine finding the home that you want to buy, driving by to check out the neighborhood, then calling your agent to set up an appointment only to find out that the home is not yet available to view. When the number of these types of listings grew, our local MLS needed to adapt and solve the problem as best as they could. 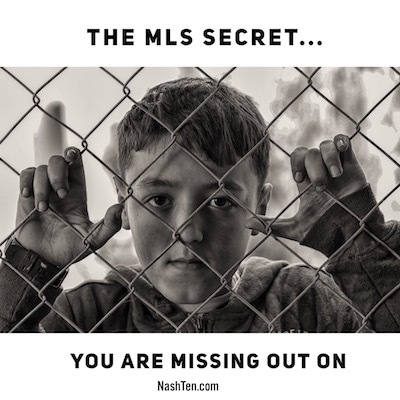 In doing so, they created the “Active-Not Showing” category in the MLS. It’s a way to build momentum for your sale without causing confusion in the market. Now there is still some debate in our industry if this is the best way to handle the situation. I don’t want to focus on that. Instead, I’d rather talk about the best use of this tool and a little known secret that’s hard to believe. Searching for Active-Not Listed homes using this tool is one of the best ways to find your next home because it gives you an opportunity to check out the details of a home before everyone else. And that jump start is huge in today’s market. Out of the 97 homes that currently fall under this category in the MLS, 76 of them are less than $400,000. Homes in this price range are some of the hardest to find and purchase right now. Another benefit is for sellers who need to temporarily take their home off the market for holidays or repairs. In the past, there was not a good way to accomplish this and advertise at the same time. And now for the secret. Many agents do not understand this category and/or use it to search for their current clients. Which means your dream home could come on the market and go under contract before you even knew it existed. And it happens every day. If you want to work with agents that use the latest technology to your advantage, then hit reply and let us know what you are looking for. And, I’ll get back to you right away. The Daily Deal in Nashville is this 3 bedroom/3 bath townhome in popular River Plantation that’s listed for less than $275,000.